high as nr. 11 but none with new material. "I would never have believed I would live to see this day and write these words. 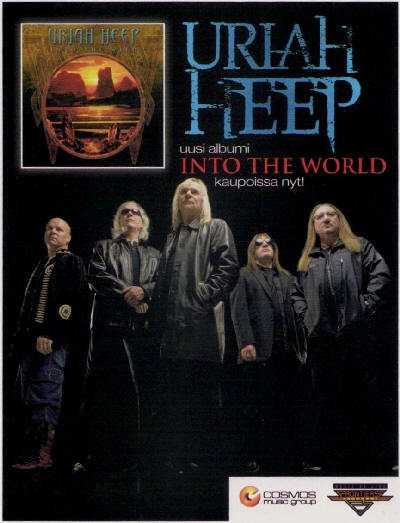 Uriah Heep to me has always been a band that reflects best the dilemma of Classic Rock bands - how to make new and interesting music in a way that even the old fans will like it. Mick Box and the guys were trying desperately to follow the new winds and fashion trends but this kind of thing cannot work- and it didn't. With a bit exaggeration you could say that a few years ago the band had fans left only in Finland and the former Soviet Union. Then something happened. The drum stool was suddenly left vacant. And Russell Gilbrook rose it. The band was like a new band. The 2008 album Wake The Sleeper already received good reviews. Celebration released in 2009 contained old hits performed by the current line-up. I don't know how well that album worked but it musta have operated as a spark to the fire you can hear on Into The Wild. The band is now aflame! 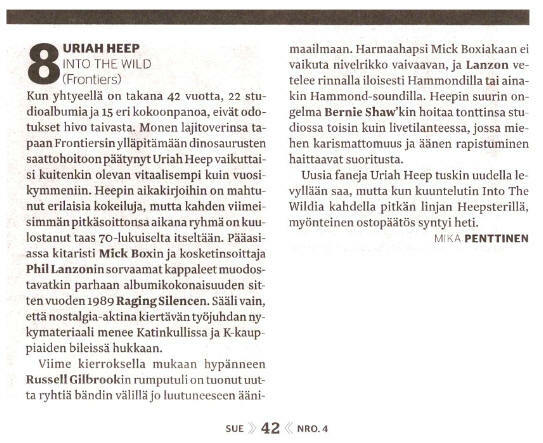 Into The Wild sounds like what Uriah Heep should sound like. A delicate progressive rock sound. As impossible as it may seem the singer Bernie Shaw almost sounds like David Byron and the songs sound like as if they had been written by Ken Hensley. Mick Box's band is no longer acting Uriah Heep. The opening Nail To The Head crushes rhythmically and makes the listener to nod his head with satisfaction. Then the pace is accelerated on I Can See You. In th chorus you can hear traditional Uriah Heep choirs. After that you're ecpecting a ballad but no! The band kicks even more vigorously with the title track. Then it is time to calm down a bit and showcase the band's more experimental side. Into The Wild is no new Look At Yourself or Demons and Wizards but you can put it place it in your shelf with good conscience next to the classic albums. "When a band has 42 years, 22 studio albums and 15 different line-ups behind, expectations are not really high. Along with many fellow dinosaurs gotten to the care of Frontiers Uriah Heep looks to be more vital than in decades. Heep has had many exprerimentations over the years but on their two latest albums they have sounded more like the band from the 70's. The songs mainly written by guitarist Mick Box and keyboard player Phil Lanzon make up the best album after Raging Silence in 1989. It's a pity that the current material is wasted at events like Katinkulta 70's festival and K-team P�iv�t where the band is mainly a nostalgy act. The new drummer Russell Gilbrook has brought new spark to the at times outdated sound. The grey haired Mick Box doesn't sound like he's suffering from arthtritis and Phil Lanzon alongside plays some great Hammond or at least Hammond souns. Also Heep's weakest link Bernie Shaw does his job in the studio well unlike at live shows where he's not always able to deliver well. Uriah Heep in unlikely to gain any new fans with the new record but when I played Into The Wild to a few longtime Heepsters, decision to purchase it was made immediately. "Uriah Heep shift to their heaviest gear. The first couple of songs of Into The Wild are triumphs of heavy metal. The hypnotic Lost and rocking T-Bird Angel on the other hand aim for the hearts of old school fans. Bernie Shaw who is sometimes overlooked for no reason has a rasping and nuanced voice and is an excellent vocalist. The trip from heavyness to the picturesque and and athmospheric Kiss Of Freedom goes by very swiftly. Into The Wild is like candy that you can overeat without getting sick.